Life Jackets for swimming, especially for non-swimmers and the younger children. Noodles are not safety flotation devices. There are no life guards and Camp is not responsible for the safety of any swimmers. To create privacy around your bunk, bring sheets or beach towels, clothesline or rope, clothes pins; for bunk convenience, a small rug, extension cord, hangers. Any special foods for dietary concerns. Refrigeration available. Scented anything: e.g. oils, perfumes, aftershave, soap, shampoo, and candles. For some, exposure to fragrances, even mild or organic ones, can trigger reactions like headaches, sneezing, dizziness, itching, and rashes. Be fragrance-free to be kind. Musical instruments are very welcome at camp. However, please check with the musical director at camp before playing during programs. It is hoped that you will keep your car in the parking lot closest to your cabin or in the lot near Kids Camp. This allows our Red Bud campers plenty of parking near the dining hall. Please, please, please do not park on the grass. The park rangers emphasize this. State Park Group Camp regulations prohibit illegal substances and alcohol. Smoking is only allowed in designated areas (along the road). There is no smoking outside the zikr hall. Click here for more information about Lake of the Ozarks State Park facilities and regulations. 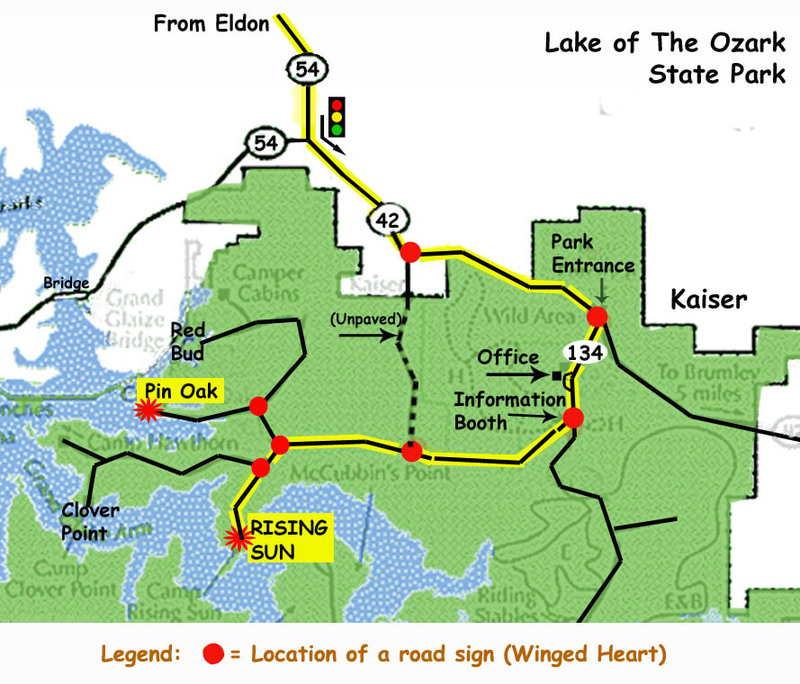 Click here for a map of Rising Sun Group Campground. Click here for a map of Red Bud Group Campground. To monitor the camp’s potential weather, look up Osage Beach, MO 65065 here. Temperatures in central Missouri vary day to day and hour to hour. Think layers as you pack your clothes.